Chord Company Clearway review | What Hi-Fi? There's an easy way to tell the latest 2018 version of Chord's Clearway speaker cable from the 2016 Award-winning edition. Its plugs are silver-plated instead of the more commonplace gold-plating. 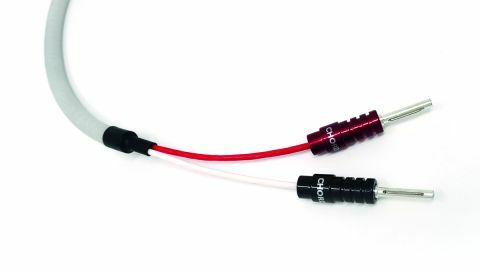 These are Chord's new ChordOhmic silver-plated plugs, which Chord claims has a marked improvement over the gold-plated plugs you'll see in other cables (including Chord's older cables). Chord has so much faith in these new plugs that the company now uses it throughout their entire range, including the high-end models. Silver is a better conductor than gold or copper, meaning the new plugs should offer less resistance and are better at preserving the audio signal from your hi-fi source to your speakers, resulting in a better sound overall. The new plugs happily haven't bumped up the price; the Clearway keeps its entry-level £10/m price tag. Elsewhere, the 2018 Clearway retains the all-white PVC outer covering introduced in the outgoing 2016 version, hiding the inner foil. But it's still there. That foil acts as a shield, which Chord says is particularly effective at blocking harmful high frequency interference. What it’s protecting is a pair of stranded copper wires, twisted together. And the effect upon our reference system makes for very interesting listening indeed. Competitors, such as the impressive QED XT40 (also £10/m), help it offer more space, detail and attack, the immediacy of which give it an early lead. Listening on, however, we find the Clearway helps the system better stitch the instruments together; it’s more rhythmic, more dynamic, more musical – Shostakovich and Beastie Boys alike. Since we first heard it, competitors such as the AudioQuest Rocket 11 (a bit pricier at £12.50/m) are able to take that musicality even further. Often, we’d tend to say cleaner amounts to better. Detail, space, frequency range – those things matter, and if the Chord Clearway were lacking in those respects it wouldn’t be given five stars. But what matters more is the knitting together and musicality, and that’s where Chord has this right for the price.